We finally got around to buying batteries for Sadie's sewing machine yesterday. When I opened my embroidery machine she saw it and instantly asked if she could "try it out." A few seconds later I saw her eyes widen as she remembered and said: "Where's my sewing machine!" It had been hiding in my sewing room, because I never seemed to remember to buy the enormous D batteries it takes. So Paul picked some up after Mass and we finally found a screw driver that would open the battery cover and then Sadie was off and sewing. She picked the fabric from a pile of felt that I have (Surprise! She chose pink!) and I helped guide the fabric from the back, while she worked the peddle and guided it from the front. We did learn that she has a lead foot. 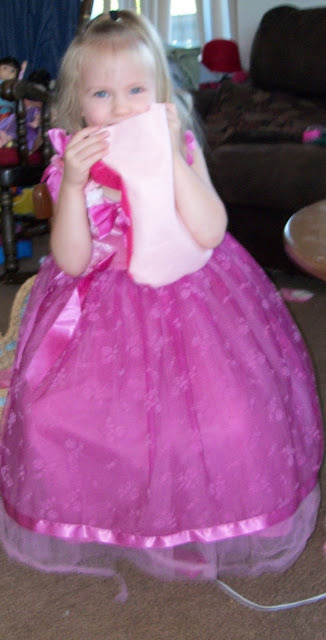 She kept trying to wear it like a hat, or use it as a puppet, while avoiding all pictures! Do now I think we'll be doing a daily sewing lesson while Mae is asleep. Mae, the climber, also seems determined to sew. She climbed up on the table in the dining room when I was in the kitchen getting ready for lunch and sat next to my sewing machine. Then she found a spool of thread and attempted to put it on the machine (correctly), while fiddling with the hand crank. That climbing incident motivated me to organize my shelf and get all the sewing machines into the bedroom! Sadie looks so proud! I've been having trouble opening the cage around the needle. How do you thread it? The metal threader just doesn't work for me! We haven't gotten to that point yet... but I didn't even see a threader, and I haven't open the cage yet. But since there's not much thread I'm afraid that is coming soon. I hope I can figure it out! This is adorable. She does look really proud as she ought. Those first projects are just so challenging and then they work and you have something that you made and can use, and it is marvelous! 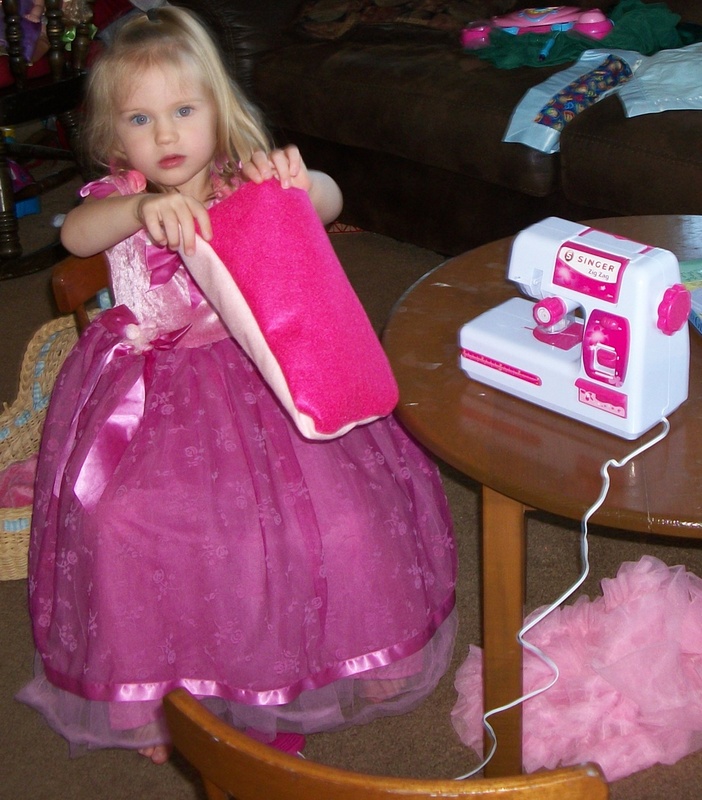 If she loves sewing I hope the machine has a cord you can add to plug it in. :) Otherwise it could get a bit expensive to run. Pink is good. Given a drawstring, a bag like that is great for holding broken crayons! So cute! Do go over & post on ACWB! That is so cute. My mom taught me how to sew when I was young. Each summer, I got to pick out a pattern and material and make something. I made pillow case, shorts, drawstring bags, you name it! I loved the time I got to spend with my mom. I was 1 of 4, so our sewing time was our private mom and daughter time.